Blowout Sale! 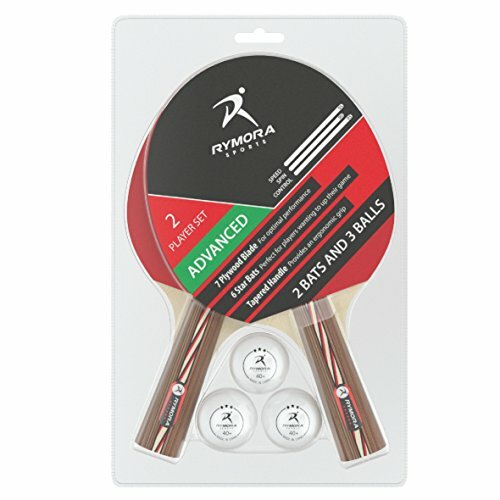 Save 58% on the Rymora Table Tennis 2 Player Set for Advanced Play (6-Star Bats and 3-Star Balls) by Rymora at Elite Team CS. MPN: RYMORA-TABLE-TENNIS-BAT-SET-ADVANCED. Hurry! Limited time offer. Offer valid only while supplies last. 2 PLAYER SET FOR ADVANCED PLAY: 2 bats and 3 balls composed of materials which means this set is perfect for advanced play at school, home, sports club or in the office. Perfect for players wanting to up their game. All our table tennis bats and balls are sourced from ITTF approved factories, providing confidence to you that you're buying quality products (beware of inferior table tennis sets available from our competitors). FIRM BLADES AND BALANCED BAT HEADS: The blades consists of 7 layers of plywood. This provides a firm structure to the bats enabling superior control to help you stay ahead in your game. Each blade is covered with superior quality soft and spongy white rubber (1.8mm) with a balanced surface with inverted pimples. This allows you put in top level power and spin into your game. ERGONOMIC DESIGN: The handles have a tapered flared design to allow for a more natural grip. This style is the number one choice of top players around the world - play like a pro. TOP QUALITY BALLS: To allow you to play right away, this set comes with three white 3-star rated 40mm plastic balls. They are celluloid free, so you don't have to worry about any health and safety issues. ORDER NOW: Don't delay, click Add to Basket now and join the thousands of others benefitting and enjoying highly rated Rymora branded products. If you have any questions about this product by Rymora, contact us by completing and submitting the form below. If you are looking for a specif part number, please include it with your message.